The government of Japan is looking to purchase long-range missiles for the first time as part of next year’s budget to address national security concerns, CNN reported Friday. 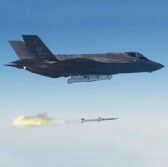 The report said a spokesperson from Japan’s defense ministry indicated it will request additional funds in 2018 to procure Lockheed Martin‘s Long Range Anti-Ship Missiles and Joint Air-to-Surface Standoff Missiles for F-15 fighter jets as well as Kongsberg‘s Joint Strike Missiles for F-35 stealth fighters. Japanese defense minister Itsunori Onodera told CNN the country aims to deploy the standoff missiles for self-defense at a range that also works to ensure the military forces’ safety. President Donald Trump recommended during his visit to Japan in November that the country buy U.S. military equipment, CNN noted. The news network added the news of the potential purchase follows reports that two missiles from North Korea’s test-firing this year flew over northern Japan and triggered warning sirens.